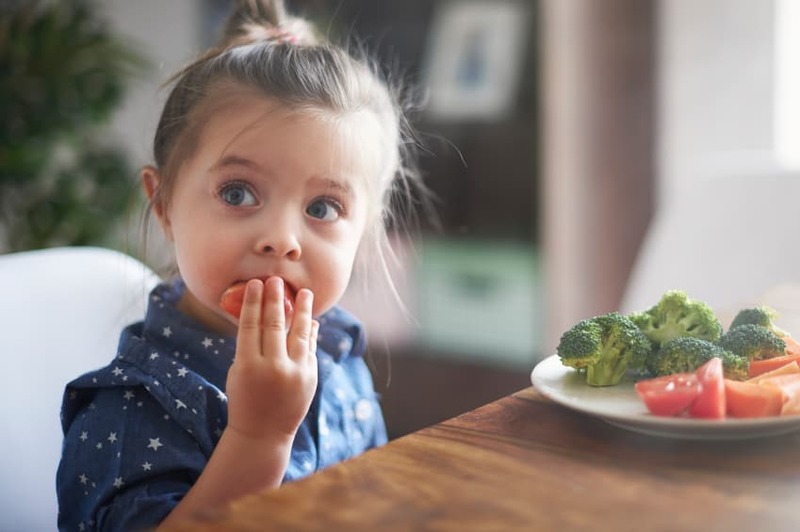 Many parents feel as though mealtimes are out of their control — they harp and fight with their kids to eat certain foods, yet ultimately, their kids are in charge. 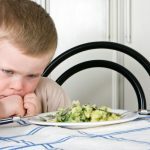 In my nutrition counseling practice, I often meet with worried and frustrated parents of “picky eaters” who describe scenarios of their kids orchestrating meals, while they scramble to appease them, hoping they’ll ingest some nutritious food. Special meals are made, phrases of pleading, coaxing and bribing overtake the dinnertime conversation, and panicked parents are left feeling stressed and hopeless. Mealtimes for many parents are anything but pleasant. Much to the contrary, they can be dreadful. It is clear to me, when I meet these well-meaning parents for the first time, that their household feeding roles are completely reversed…and they have no idea. Kids are ultimately in charge of what, when and where food is served, and parents are doing their darndest to control whether and how much their kids eat. This is opposite of what it should be. To grow healthy, happy, and confident eaters, parents must set healthy boundaries. Kids should be granted the control of whether and how much they eat, but that is it. This is challenging, especially when kids are going through picky eating phases. I’ve been there and I get it. But if the feeding roles are reversed, it actually perpetuates picky eating. 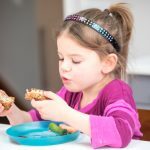 I’ve written more about this in Five Common Feeding Mistakes That Parents Make and 3 Picky Eating Strategies That WORK. Your child refuses to eat, so you give in and stop asking him to come to the table. He complains about what’s served, so you make him a peanut butter sandwich because you know he’ll eat it. He whines about feeling hungry before bed (even though he didn’t eat at dinnertime) so you give him yogurt and a banana in hopes that he’ll go to bed peacefully and not wake up hungry. If it does, you’re certainly not alone. 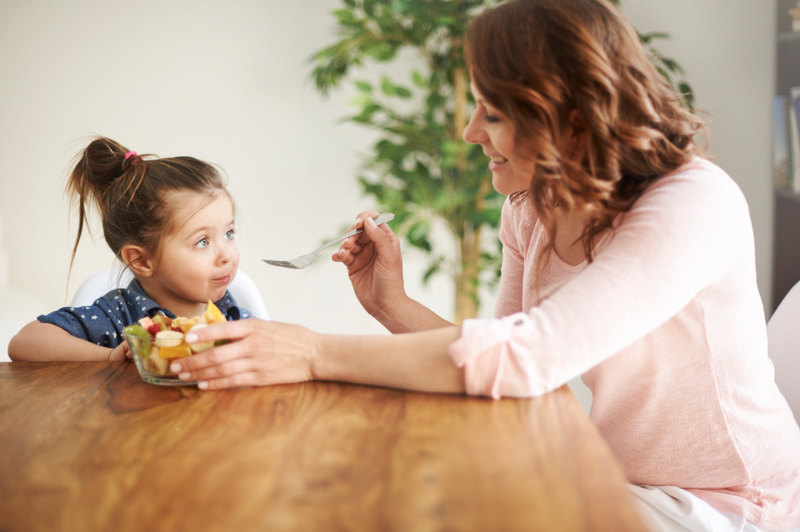 By establishing some appropriate mealtime boundaries with your kids (and enforcing them consistently), you can regain control over mealtimes (the what’s, where’s and when’s of feeding) and allow your kids to take care of the rest (whether and how much they eat). This is the cornerstone of childhood feeding expert Ellyn Satter’s Division of Responsibility. Parents are in charge of what is served, where it is served and when it is served. Kids are in charge of whether and how much they eat. Establishing these boundaries early on (in infancy and early toddlerhood) makes things a lot easier as they get older, but these boundaries can be set at any time (the older they are, the more patient you’ll have to be). Five words that you will want to use A LOT are: YOU DON’T HAVE TO EAT. 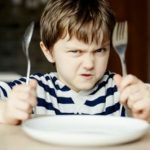 When my son says “But I’m not hungry” or “I don’t want spaghetti again!” I calmly reply “You do not have to eat, but it’s mealtime and you must come to the table.” Nine times out of 10, he eats a fair amount of his meal happily. My kids aren’t excused until at least 10-15 minutes have passed and must ask to be excused. If you have a slow eater, you may want to set a timer for 30 minutes so that meals don’t drag on forever and ever. This allows your child to better pace him/herself during a meal. We reserve mealtime for family/catching up time and discourage mindless/distracted eating. Sitting properly at the table, not throwing food or making rude comments, using age-appropriate utensils and being polite are rules that we keep in our house. Although I offer lots of variety and I always serve at least one food that I know my kids like, there is one meal (and only one) served–I’m not a short-order cook. If I feel that my kids haven’t eaten enough, I remind them that it’s a good idea to make sure that their tummies are satisfied because the kitchen will be closed until __ o’clock (or the next morning). Requests or demands for snacks outside of these times are gently turned down, with a reminder that they had a chance to eat at the last meal or snack, and they chose not to. Over time, kids learn how to regulate their appetite healthfully this way. Random requests for snacks or milk are often gently turned down, and instead, we decide when snack time is according to when meal times were. 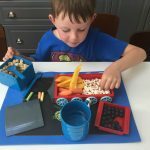 Because my kids are 5 and 2, we offer a snack in between most meals and sometimes before bed (not often), so that there are eating opportunities every 2-3 hours or so. 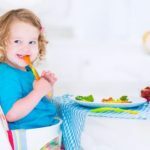 Kids have small tummies, so need to eat this often, but they do not need to graze around the clock–this in fact often spurs mealtime battles. Here’s more on why you should end the graze craze. 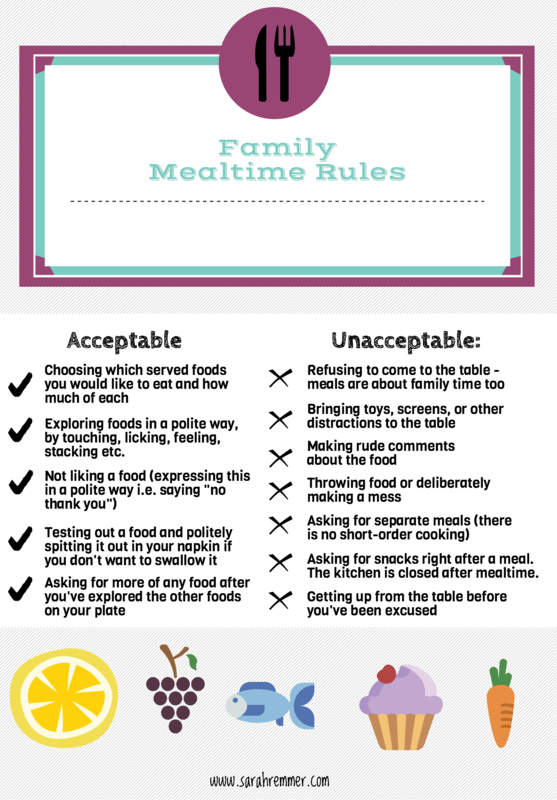 To help you get started with healthy mealtime boundaries, here’s a list of acceptable and unacceptable mealtime behaviours that work really well in our house! I share free kids nutrition and feeding advice, and yummy recipes over on my Facebook page daily if you’d like to check it out! Do I do this with a 2 year old?? Clip him down screaming into his booster?? I don’t want to cause an aversion to meal times. And secondly if they do decide to eat, but will only eat that one thing on the plate you know they will enjoy (like pasta) and are asking for more pasta do you give it to them. Or if they are done with the favourite item do they just have to eat what’s on the plate??? Hi Christine! Hmm this is a tough one. 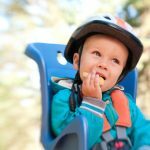 If dinnertime has been a negative experience in the past (there was lots of pressure), your toddler may not want to be at the table at all. I would really stress to your little guy that he DOES NOT have to eat, but that dinnertime is family time and it’s important that he come to the table. I would still have him in some sort of high chair and make it SUPER positive. Get him involved in prepping dinner so that he’s exited to come to the table. Best of luck! This is so helpful – thank you very much! We always offer my 2-year-old daughter what we are eating first, but if she doesn’t eat it, we’ll make her something else. This is a great reminder to stick to our guns. I have a question: sometimes if she won’t eat what’s for dinner, she will wake up in the middle of the night hungry and ask for a banana, and we oblige so she can go back to sleep. What’s the best approach in this situation? Hi Sally! It’s so hard to stick to our guns with this, but so important. If your daughter is waking up in the middle of the night often, I would make sure that you’re offering LOTS of variety at dinner (with one or two things that you KNOW she will accept) and reminding her to fill her tummy because there’s no more food until morning. The other thing that I would suggest is to try to schedule dinner at least 2 hours before bedtime so that you can schedule in a planned bedtime snack that includes some protein and fruit or whole grain (greek yogurt and fruit or whole grain cereal and milk) make sure to switch this up and not cater to what your daughter wants for these snacks (but being courteous and offering her fave foods sometimes). This will help to get her through the night (and let you sleep too!) Hope this helps! My twin 3yr old grandsons never seem to be full. They always eat everything that is served yet always ask for more and then some! My daughter is very strict about the type of foods they eat ( no junk food, fast foods, juices, chocolate, candy etc..) snacks are more like yogurt, healthy muffin, yogurt raisins, cheese, fruit etc.. they never get enough! How much can a 3 yr old eat?? I have a question about letting them decide how much they eat. Does this mean at supper time when all my son wants to eat is noodles, I keep giving him more noodles until he says he’s full even if he doesn’t touch the rest of the food on his plate? In a nutshell, yes. 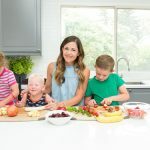 It’s important to always serve a balanced meal (the same one that the rest of the family is eating) and then letting your kids choose from the foods that are offered (and how much of each). It’s hard letting your kid gorge on noodles I know, but it’s all about the long-term goal — you want to model healthy balanced eating, and not pressure them so that they learn to enjoy a variety of foods in their own time. Hope this helps! Hi. I have always followed most of this however my 3.5 year old recently is no longer eating most things that he used to eat even. I have just gone through 3 weeks of enforcing no extra foods outside of the snack / main meal option and he ate very little. He was hungry. He kept begging for food and in fact his behaviour was terrible because he was hungry. I feel at a loss because I would rather he ate a banana and sandwich and wasn’t beside himself but then I am getting very concerned about his eating and it seems only to be getting worse. Any advice? He is a twin and his sister whilst also picky will try most new things and eats a wider range. and we can maybe set up some one-on-one time! 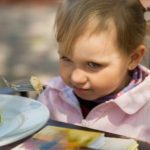 So what are you supposed to do if the child is throwing food since it is an “unacceptable behavior”? 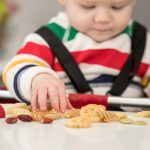 All toddler’s have thrown food (so frustrating), but it’s important to set boundaries. If food was dropped from the table I would pick it up once and let them know that throwing or dropping food is not allowed and if they do it again that I will take their plate. What you don’t want to have happen is for them to think it’s a game. “If I drop my food, mommy will pick it up again and again… haha”. Big no-no. Let them know the consequence and follow through. At this point kids have usually filled their tummies and are ready to get down from the table anyways.